Enter your name and email below and the download link will be sent to you. For Windows, Mac, and Linux! 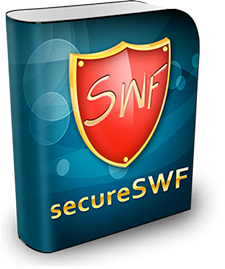 Cloak your SWF files and lock down your intellectual property with secureSWF's powerful SWF encryption. secureSWF's SWF encryption fully encrypts your SWF file, creates a loader SWF using an advanced preloader designer, and places the encrypted SWF file inside the loader to be decrypted securely at run-time. You can design the preloader yourself using the drag-and-drop designer or select one of the many customizable templates secureSWF ships with. The encrypted loader acts like a first line of defense. It protects all your assets including images, graphics, animations, sounds, and videos from decompilers. When attempting to decompile the encrypted SWF file, the attacker is confronted with the highly obfuscated code of the loader. secureSWF's SWF encryption also protects from memory debuggers. Decompilers will not be able to grab the decrypted SWF file from memory. With secureSWF, you can specify a number of domains or locations for your Flash applications to launch from. This will ensure that your Flash application will not load if it is being launched offline or from another website. If someone managed to copy your SWF files somewhere else, then the application will not work at all. What makes this feature powerful enough to rely on is that the domains that you have locked the application to are encrypted inside the SWF files and will only be decrypted at runtime. This makes finding out what is happening and changing it an extremely time and effort consuming task. 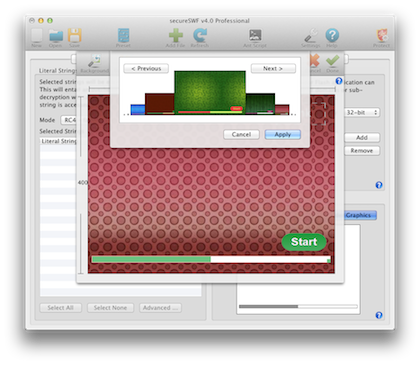 Recreating the application from scratch is usually easier. While obfuscation protects the code logic, valuable data such as access passwords and sensitive URLs remain in the SWF file as clear text. Attackers can simply open the SWF file using a text editor, after decompressing it, and view the literal strings in your code. secureSWF's can replace string literals in your code with encrypted binary blobs which are only decrypted securely at run-time when needed.